These days, it seems to be all about “deals” if you want to get the most out of life (or your money). For example, if you sync your American Express card with Twitter, you’ll gain access to all types of special deals. The same types of deals are available for Capital One app users, or for Bank of America customers via BankAmeriDeals. Deals are certainly the new coupon, though one could argue that they’re really just the second generation of the almighty coupon. Presumably, its name is derived from banking and “syncing,” the latter being another big buzzword nowadays. Kids love to sync everything, and you should too if you want to save lots of money. Put simply, Bync allows you to sync your credit cards and debit cards so you can gain access to deals, coupons, and other offers. It’s different because the deals are tailored to you, based on your spending habits, as opposed to just being blind offers. Think of it as a solution to the many, many deal sites popping up left and right, which are clearly time consuming to navigate. Supposedly the Bync deals have a 4x click rate compared to the average deals site, so they must be spot on. At the moment, roughly 10,000 banks are connected to the Bync service, including most major banks and credit card issuers. I use American Express for most of my spending, so I decided to sync my Blue Cash credit card. You have to use your login credentials from American Express (or whatever bank you use) to sync your card with Bync, but they ensure it is secure. In seconds, they spit out a neat looking list of all the merchants you shop with, or at least those recognized by Bync (apparently there are 1000’s of stores involved). It’s very pretty, that’s for sure. 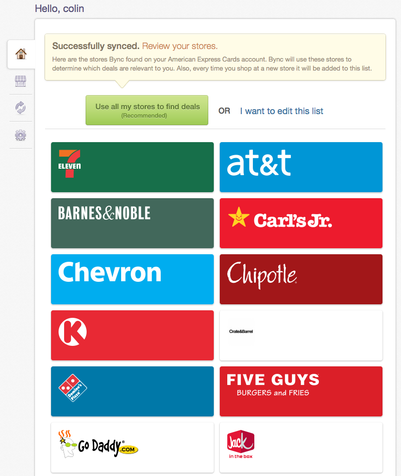 Also note that new stores will be added automatically, so you may have to filter over time. Anyway, once you’ve decided on your list, all you have to do is sit back and wait for your daily deal alert e-mail to arrive in your inbox. It’s as simple as that. 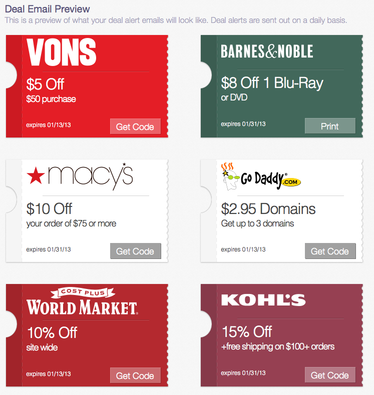 The deals will have associated coupon codes if they are online offers, or they could be in-store coupons. Tip: If you plan on trying Bync, you can only sync one card for free – so choose wisely. 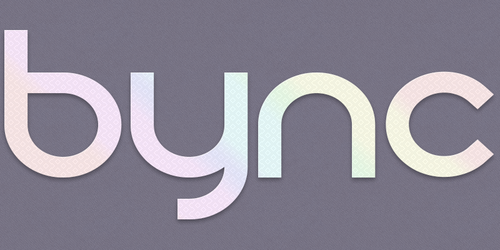 Additional syncs require a Bync Pro account, which starts at $3.99 a month. Bonus: Track Your Spending for Free! Finally, Bync comes with another little bonus – the ability to track your card spending for free. Sure, some of the credit card issuers offer snapshots of spending too, but Bync does it prettier. 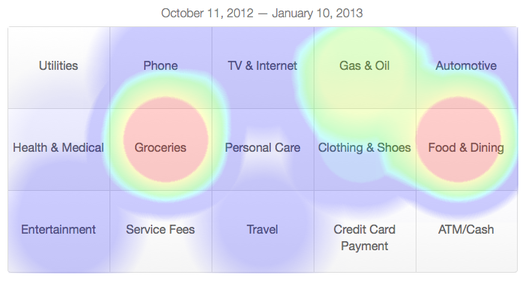 They’ve even got a heat map that shows where you spend the most (or the least). And you can see actual dollar amounts if you toggle over to your full list of merchants. You might be surprised to see how much you spend with certain merchants, especially seeing that the font is so LARGE. Update: So I’ve been receiving the daily Bync e-mails for a few days now and I have to say they’re not bad. Some of them are run-of-the-mill offers from Kohl’s and other big department stores that tend to be quite ubiquitous, but others are pretty unique and valuable. All in all I’m happy with it so far and hope to save some money via the service. Next Next post: BillMyParents SpendSmart MasterCard: Good for Your Teen?